A decade after Directive 2002/91/EC of the European Parliament and Council, the Energy Performance of Buildings Directive (EPBD), was promulgated, a new Energy Efficiency Directive (EED) entered into force on 4 December 2012. Much change has occurred. The EED is a framework directive which sets overarching objectives and targets. Coverage includes virtually all aspects of the energy system: supply, transformation, transmission and distribution, and consumption. There are three climate and energy targets to be reached before 2020: a 20% reduction in greenhouse gas emissions, 20% of energy derived from renewables and a 20% increase in energy efficiency. The 20% reduction target is defined in Article 3.1 of the EED as a maximum of 1483 Mtoe primary energy or 1086 Mtoe final energy consumption in 2020 and according to Article 1, its achievement is the objective of the framework of measures established by the Directive. 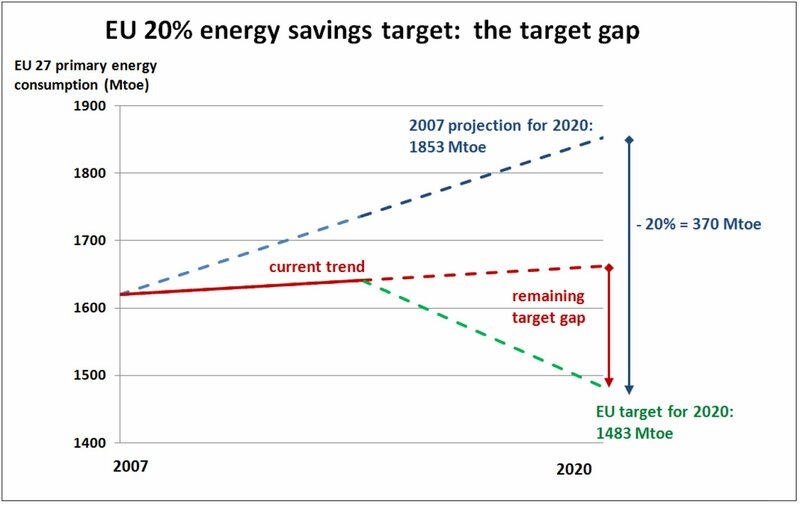 The reduction target is relative to an energy use projection made before the EED was promulgated, so there are complications in understanding what the reduction means, but basically the objective is to cut projected 2020 primary energy use of the EU27 states from 1853 Mtoe to 1483 Mtoe (savings of 370 Mtoe). The figure here shows the projection (made in 2007) and the savings value. The savings target is not sector-specific, so all sectors are included. Articles 4 and 5 of the EED cover buildings but only give general guidance. In Article 4, Member States are to establish a long-term strategy for "mobilizing" investment in the renovation of the national stock of residential and commercial buildings, both public and private. A first version of the strategy must be published by 30 April 2014 and updated every three years thereafter. Article 5 covers public sector buildings, which are also required to meet the requirements of the long-term strategy.